Opened in 1999, the Arena Sports Centre is a dual-use facility funded by a combination of sources from Bognor Regis Community College (now The Regis School), West Sussex County Council, Bognor Regis Town Council, Arun District Council & local Parish Councils, along with a lottery grant of £2.29 million. Since 1999, there have been a number of extensions onto the building to accommodate the Sports College, School Sports Co-ordinator & the Aspire Sussex reception. Avisford park Rose Green is a flat green grassed area covering approximately 8 acres which provides a valuable recreational area. The park is used regularly for local football matches, dog walkers and residents. In 1988 there was plans to build a large retail outlet on the green, but due to strong opposition the plan was dropped. The 'Beach on the Beach' is located on the East Beach promenade and is open during the summer months. A huge sandpit for children that can now enjoy the beach even if the tide is in. Situated just on the outskirts of Bognor Regis town centre, Bersted Brooks covers an area of some is 46 acres comprising of 3 fields alongside the Aldingbourne Rife. The area has a wide variety of valuable wildlife habitats including mature trees, hedgerows, ditches, scrub & wetland. It is home to many wildlife forms. Bersted Brookes has a free car park. Famous for his poetry, William Blake lived in Blakes Cottage Felpham between 1800-1803. While in Felpham he began work on his epic poems, Milton and Jerusalem. Right on the seafront of Felpham beach near the Sailing Club and Café, are the Blakes Road tennis courts and putting green. A peaceful place to enjoy a game of tennis or putting in a lovely location. Blakes Road Tennis and Putting are open from 31st March - 30th September (weather permitting). Other refreshment facilities nearby will have their own opening times. Blakes Cottage is also nearby. The Ice house in Bognor Regis was built circa 1792 for Sir Richard Hotham who led the development of Bognor as a seaside resort. It was used to store ice for domestic use and to keep food and wine chilled. Blocks of ice were separated with straw which is well known for its insulating properties. Situated in front of the Edward Bryant School in London Road Bognor’s ice house is in a remarkable state of preservation and is a tribute to the skill of the men who built it. The construction consists of a 28ft. deep central area from the dome to the floor, which is below ground level, and the diameter of the chamber is approximately 12ft. The circular exterior wall is of fine brickwork with the dome being cemented on the inside. The ice house of Bognor Regis is one of the best examples of its type in Sussex. Bognor Regis Museum is really well worth a visit. 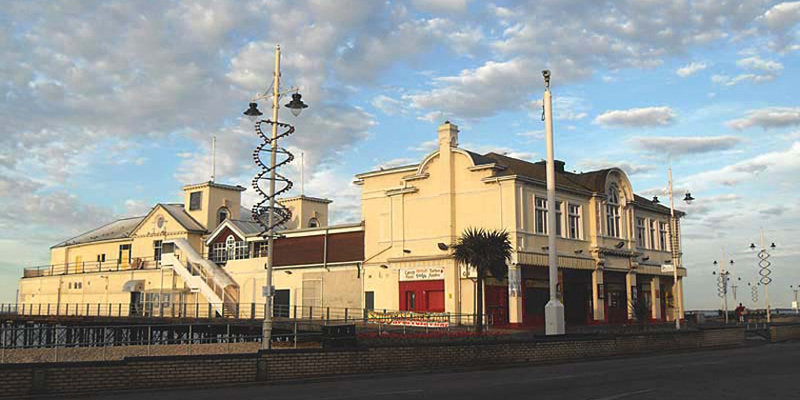 The Museum includes not only a wealth of information and pictures of Bognor Regis and artifacts of history, but also includes a wireless Museum of radios dating back many years. First opened in 1865, Bognor Regis Pier has seen hundreds of people walk on the Victorian structure to admire the beach views and take in the sea air. Today it still continues to be one of the most visited places in Bognor Regis to take a walk along and admire the sea views. During the summer months, there is a promenade train that runs from near the Forshore Office to Beyond Butlins. Pick up /drop off points at Butlins, and opposite the Regis Centre and Visitor Information Centre on the eastern esplanade. The promenade train operates April - October, weather permitting.